Our captain Jordan Henderson has urged the club’s hierarchy to give Jon Flanagan a new deal, saying the young full-back is “a huge player for us”. 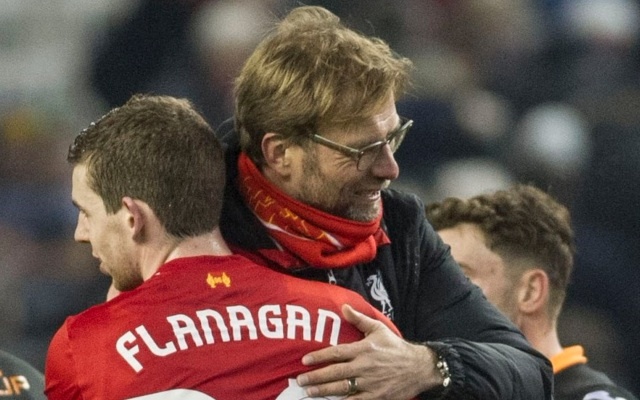 Flanagan’s contract expires this summer, but talks about a possible extension have not begun. “It’s huge that it gets sorted out”, Henderson said (via Echo). “I don’t think players and people like Flanno grow on trees to be honest. “You have people like him and Stevie and Carra who have come through the Academy. The fans feel as though they are one of them really which they are. “His whole family supports Liverpool. He has been a Liverpool supporter since he was a kid and he has had a difficult time for the last two years, but what I have seen him do behind the scenes is incredible really. Flanagan famously made a playing return in January after 18 months on the sidelines. To the club’s credit, he was given a new deal whilst out injured, but that will be meaningless if he is now allowed to leave. Surely he has to get a new contract? In fact, surely he needs to be playing left-back for the rest of the season? Although he is a right-back by trade, he played left-back for most of his 2013-14 breakout season. After Moreno’s miserable performances in recent months, we think it’s time he was reinstated to the roll.